IT managers understand the hazards of heat inside data centers. But what about outside it? "At one time, you could go through a whole career without facing one of those situations" -- something like a Sandy -- said Cordell. But he now believes if "you have a career spanning more than a decade" you may see one or two major weather events. 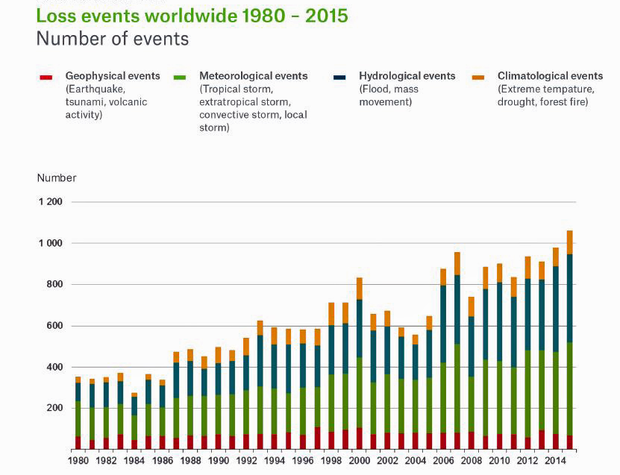 Scientists are increasingly connecting extreme weather events to man-made climate change. Insurance claims are rising. The warmest year on record for the planet was 2015, and this year is on track to beat it. In fact, 15 of the 16 warmest years have been since 2000, according to an analysis by NASA and the National Oceanic and Atmospheric Administration. 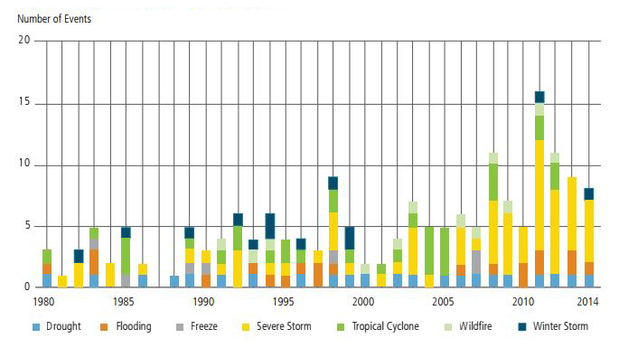 Costly weather-related disasters have been increasing in frequency over the past decade. Spending on disaster recovery (DR) tools and systems is rising, but not dramatically. But DR spending doesn't fit into a neat category. When a business decides to move to a cloud-based service for compute resources and software, improving disaster resilience may now be a leading reason for this decision. Computer Economics says it is seeing "solid growth" in infrastructure as service, "and we think disaster recovery is a key driver," said John Longwell, vice president of research at Computer Economics. With infrastructure as a service (IaaS), users access compute resources remotely. Interest in disaster recovery planning increased after the 9/11 terrorist attacks, but "many pulled back because of the cost of maintaining two centers," and paying for idle equipment, said Phil Goodwin, a research director at IDC. Cloud-based services are changing that. The fastest growing segment of disaster recovery is "disaster recovery as a service," said Goodwin. There may be 150 or more firms providing disaster recovery as a service (DRaaS). Taco, Inc., an HVAC manufacturing company in Rhode Island, maintains servers in a back-up facility run by a disaster services provider. But by the end of this year, the company hopes to complete a move to a disaster recovery as a service provider. Dennis Rachielle, a senior network administrator at Taco, says the firm has been shifting DR services to VMware vCloud Air disaster recovery as a service. "What's more appealing to me is it is less infrastructure I have to manage -- less hardware, (fewer) contracts to worry about, and hardware upgrades and replacements," said Rachielle. Disaster recovery as a service "takes away that IT piece," he said. Taco has already virtualized its infrastructure on VMware, but Rachielle says he expects he'll have to keep his virtualization upgrades somewhat in sync with VMware's upgrades. 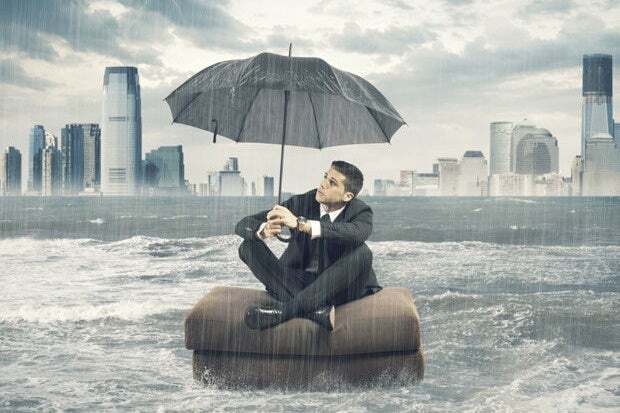 Disaster recovery as a service isn't necessarily less expensive than in-house DR systems, Gartner warned in one report. But it may be "very cost effective" if the alternative is a recovery site build-out with new equipment. New York's DOT runs its two data centers in "active/active" mode, meaning the systems are kept synchronized and managed in a unified way. It has a large number of legacy and custom-written applications, which complicates, technically and cost-wise, cloud deployment. But cloud services are an important part of its DR availability strategy. About a year before Sandy hit, DOT began using Amazon Web Services for some its applications. Since just about everything the agency uses involves mapping, it built a Web infrastructure to support geographic information services (GIS) services on the Amazon platform and can now relatively quickly add new applications that utilize mapping. Hurricane Sandy cut most of power in the New York region. The DOT's primary data center was on the seventh floor of a Manhattan office building. The generators were on the 13th. The storm sent water into the building, flooding the basement. The weight of the water crushed the fuel tanks. DOT had a secondary data that remained operational, but it couldn't provide all the services of the primary data center. Amazon services gave it some important online services through the storm and that helped it to respond quickly to the recovery, said Schachter. "If you're not in the cloud in some way right now -- even if it's just for testing purposes -- it's really malpractice if you're in IT," said Schachter.